Every time I see this little Pom-Pom Sheep I recently made, I hug and wiggle it so the little arms and legs dangle. It’s completely irresistible, and if you make this with your kids, I promise you they’re going to love it as much as I do. I mean, how could anyone not love a fluffy pom-pom sheep?! I have to credit Hobby Lobby for the inspiration. I spotted a photo idea on their site a while back, and used that to figure out how to make my little farm fuzzy. First I had to find an over-sized plastic egg. Easy! I painted it white and let it dry. It doesn’t matter if the paint is sloppy; it’s just for background. 2. Now for the fun part! 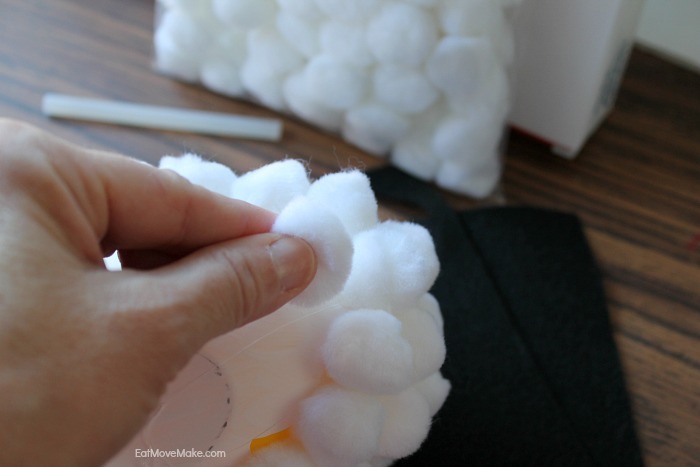 Hot glue white pom-poms all over the egg — everywhere! 3. 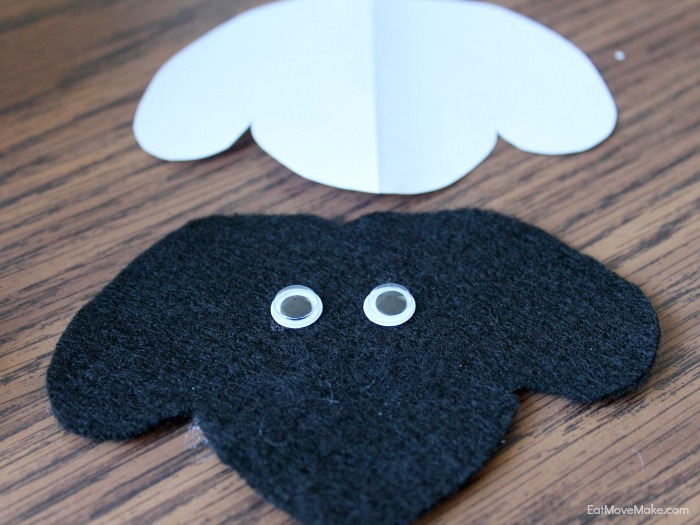 Using my free printable pattern, cut a sheep face out of black felt, use tacky glue to attach the wiggle eyes and then hot glue it to the body. 4. All that’s left is to string together the pom-pom pom arms and legs. Double up the thread for extra strength and knot one end. String one 1-inch black pom-pom followed by three 1/2-inch black pom-poms. Leave a tiny bit of slack so the arm will be wiggly. Tie off the chain of pom-poms with a knot. Repeat for the other arm. 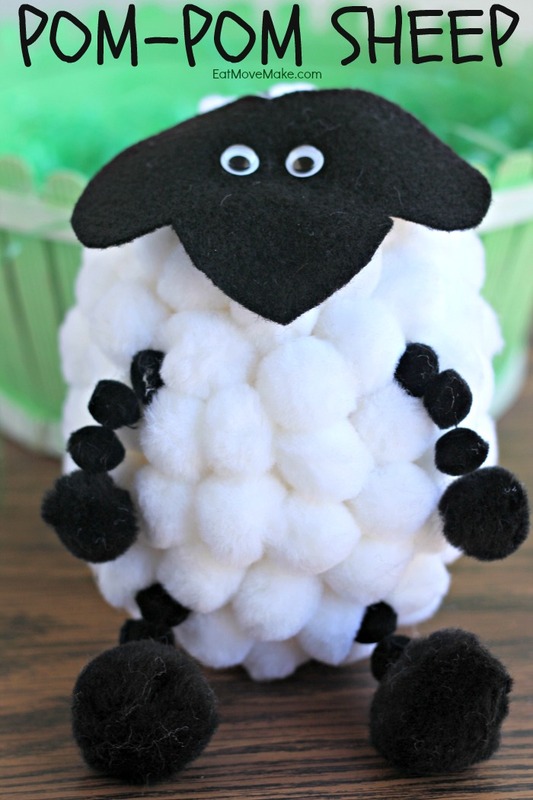 Now your sweet little pom-pom sheep is ready for Easter! So cute and Easter-y! Thanks for sharing at Funtastic Friday 118! by the way, my first visit to your blog. Any finally, welcome you all to our Colourful baby. Awe, i love this little sucker. He’s so cute and fluffy. Definitely one to do with the kids. This would be great for kids. Adorable idea for Easter! Such a cute craft! My kids would love to make these. This is a really adorable craft and something I would love to make with my niece! That is really cute! It looks pretty easy to do. I love how your sheep turned out. Great idea for little kids at easter time. Thanks! This is so stinking cute and would of been perfect for me and my 4 nieces to do together. They love little hands on DIY projects so I will definitely keep this in mind! It makes me smile when I see it so I know it would be fun to make and share. Awe…that is such a cute holiday craft!It really came out nicely. Just found your blog through TBS. This is so cute! oh, my goodness! What a pretty neat and easy craft idea. My daughter would love to try this for sure. Thanks for sharing! This looks fun and easy to make, my nephew and niece would have a ball making these. Thank you for sharing it! I think the moms would love this from my group. Awww how adorable is this pom pom sheep, too cute! This is the cutest craft I’ve seen in long time! I’m going to pull out the craft bucket. We might have just enough pom pom’s to pull this off. It would be so cute in the kids Easter baskets. These are adorable! I love cute little Easter crafts and this one looks so sweet! This is such a cute little craft-almost makes me wish I was a primary school teacher so that I could have my students do it! This looks fun and easy to make, the kids would have a ball making these. Omg this is so cute. 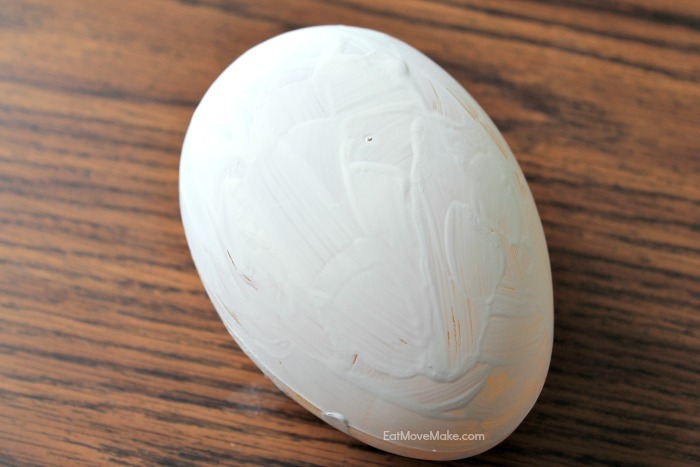 What a great Easter project for kids and big kids alike. Great use of cotton balls and felt! Very DIY. This is so cute and so perfect for Easter – have a good one! Cute idea! So adorable. Thanks for sharing this with us. Now I know what to make next time around. That’s adorable. I will be showing this to my daughter, she was looking for some things to do for Easter. I’m going to have to show this to my daughter. She loves doing crafts, and we just happen to have a ton of pompoms in the craft room. This is so cute! I am going to use your idea and make it with my class! Thank you for sharing it! I love how it looks very simple to make but looks so cute! Who doesn’t love a cute little sheep? This is so cute. Will share with my friends. So much fun ! Adorable ! This is really adorable!! I could see me playing with it just the way you do. My children will love making this! Thanks for sharing! What a cutie!! I am going to have to make this with my special needs son. He would love this sheep and I have the supplies. Thank you so much for this adorable craft! Your pom pom sheep is adorable. I can’t wait to have grandchildren so i can make cute fun craft projects like this one. 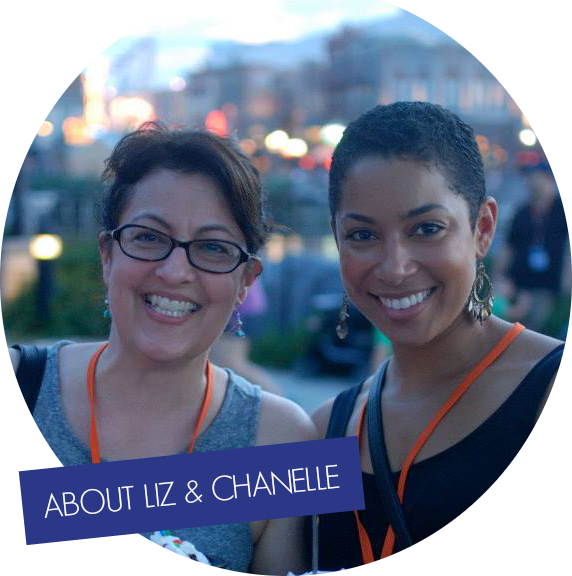 Liz, this is super cute! Easy enough not to scare of beginners but complicated enough to look like you really made something cool! Those are the cutest little guys! Love that you used an Easter egg as the base. How perfect! I think using the Easter egg was a great idea as well. That makes this craft perfect for Easter! Baaa what a cute pom pom sheep. I know my grand kids would love to make this so I’ll have to see what supplies I need. He is cute. I’m going to pin him when I get home. Seriously cute idea! I’ve done the paper plate ones with the kids but this is too cute not to try this year. So creative and cute! Wanna try it for my son. Thanks for sharing! What a super fun craft. Those sheep are so cute. I’ll have to bookmark this and create these with my girls. 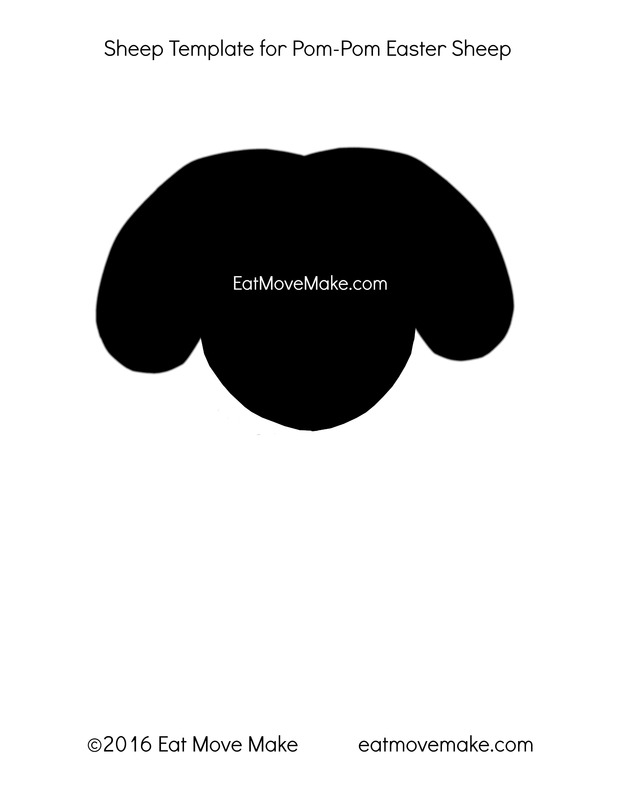 This pom-pom sheep looks do adorable! Love the craft idea! So creative! Happy Easter! I still love playing with pompoms as an adult.. I just wish I had a kid so I could make these with them because they are so cute! My kids love doing crafts. This is so cute. we will have to make one on the weekend. This is an adorable craft to do. I will have to make this with my friends little ones when they visit next. Oh my gosh! This is so cute! I will have to make a little sheep with my son. What a great craft project for Easter. Aww, how cute! My daughter will love these! I will have to make them with her! These are so cute! I am going to pass this post on to my sister-in-law as my niece would love to make these at Easter. Oh my goodness, these are too stinking cute! My kids would love to make these! This is a very creative activity that kiddos would be fun for sure. Such little cute thing. HAHAHA – too cute. I don’t have the time to make one, but hopefully someone will make me one. I love the idea of doing these with my niece and nephew! A fun craft for a little older kids! Really , really cute! I can see how kids (and adults) would love making these. Happy Easter! Now he’s just pretty adorable. My kids would love making this egg! Love it! Can I just tell you how incredibly sweet this is? I bet kids get a great memory out of doing a project of this nature. Wow, I have two little boys who would adore making these for Easter, thank you so much for sharing this craft with us. That sheep is totally adorable! And it’s simple enough that even craft-challenged me could do it! What an adorable idea! Those look so cute! This craft is so adorable! This would be a great idea for keeping the kids entertained while it’s been cold outside. Crafts do not come easy to me, so I truly enjoy your video so that I can see each step. Such a cute sheep! I’m totally making these this year for Easter! They are so simple, but absolutely ADORABLE! Thanks so much! That’s so cute! I’d love to do this at home as well. It’s not that difficult to make either. Thanks for the lovely idea! What’s great is that you can make different animals! That sheep is just too cute. The kids will love this craft. Thanks. What an adorable craft!!! I might do this with my boys this weekend! It is Shaun the Sheep aha! I love your pom pom sheep it is so adorable! I can see my little sister wanting this! Awww so cute. Happy Easter. Have a good one. Cute craft ready for Easter. Sharing with friends with kids. 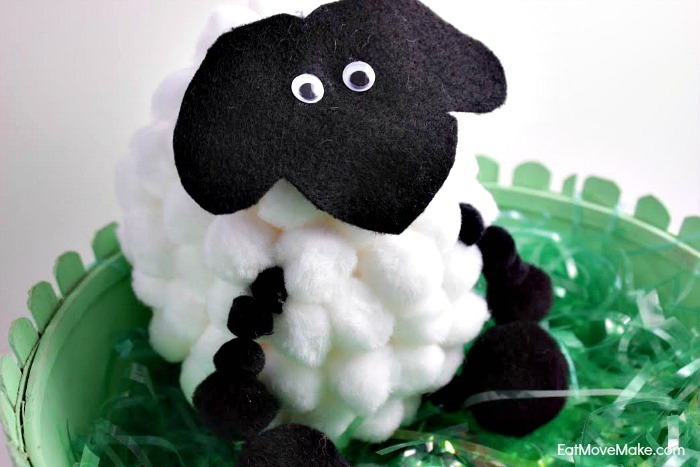 Like the Video simple way you explain how to make Pom Pom sheep for Easter. What’s that spring phrase “In like a lion, out like a lamb”??? This adorable spring craft is perfect for the whole season. That is so cute! My mom saved some of our holiday crafts from when we were kids. I know she would have kept this one! What a cute little craft that the kids would love to make. Perfect to make on Easter day while dinner is cooking. OMG that is the cutest, I’m sure kids will love making it. This is a lovely little activity for the kids, this. Very creative! What an adorable Easter craft! I love it! This is super adorable!!! We are making eggs this weekend, maybe I will save some for this! This is really cute! We just dyed Easter eggs this morning and even though my 3 year old was impressed, I needed something else to do with them so this will be our activity for tomorrow! That is adorable! I have to watch a little girl this weekend and this would be a fun project to do with her and my son. I kinda wish I saw this post or this post was made when my son was little. He would totally appreciate it. He’s 10 now so he’d probably give me the death stare if I made him one haha. These are so cute!! Great window sill decorations s that can double as a family activity! This craft looks so cute. I bet my son would enjoy doing it with me. What a fun craft for Easter! Thanks for sharing. Have a terrific Tuesday. It is super cute, right? Who wouldn’t love to make one? That is super cute. I want to make these with the kids. They will get the biggest kick out of them.